This individual Report Commerical Capture Solutions is available for purchase. This Report is available to members of Mercator Advisory Group’s Emerging Technologies Advisory Service. Please be advised that this Report is normally part of a research and advisory service that provides ongoing support throughout the year. As such, this Report contains significant depth of content that is selected for its strategic importance to our members. (For a description of these services, see our Advisory Services section). Remote deposit or check image capture has taken off far faster than expected. The rapid adoption of the product by banks and commercial customers alike has taken the industry by storm and revived the sagging check segment of payments. As this new form of the customer/bank relationship takes shape, FI's and solution providers will need to address a number of new questions. How large is the corporate capture market? How fast is the market growing, is it sustainable and for how long? What new industry dynamics will shape competition for commercial clients? "From the large multinationals to the smallest community banks, check imaging in the form of corporate capture is being rolled out to commercial customers across the US," according to Michael Friedman, Director of Mercator Advisory Group's Emerging Technology Practice and principal analyst on the report. "Apart from the obvious, this has a tremendous impact for banks and specifically online banking, in terms of the way commercial customers are served." 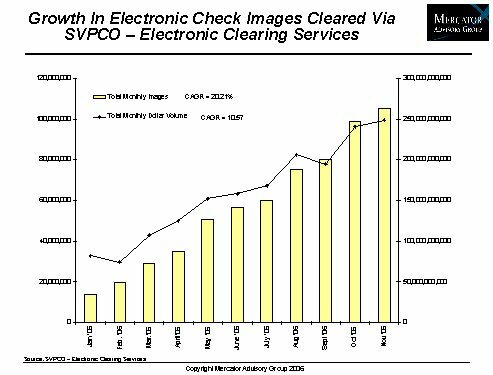 In Commercial Capture Solutions, Mercator Advisory Group examines the rapid growth of check image deposits in 2006 and the increasing use of check images for inter-bank transfers. Three leading banks are profiled to gauge the growth in check imaging. In addition the report looks at published results from check image exchanges and the Federal Reserve Bank. The report also attempts to quantify the commercial capture opportunity. Using data from the Bureau of Labor Statistics, the report estimates a potential customer base for commercial capture products. Delivery strategies for banks are reviewed as well as a look at the strategic questions banks will want to answer in the new check economy. Finally, a review of potential hardware solutions is included. One of the 8 Exhibits included in this report. The report is 20 pages and contains 8 exhibits.